Method II: A better method? It is said that the L+2 group is alive. However, when there is a descent at , it is not exactly the case. The tesuji of and exploits the stone. What works for the L+2 group case does not work here. The atari at is a mistake. After , due to shortage of liberties, White is unable to prevent Black from connecting the three stones at a. White's best response is . Black can play either a or b. Many books suggest making the throw-in at directly. This is a two stage one move approach ko. 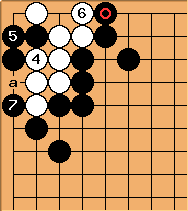 The required approach move is , converting it to a direct two stage ko. 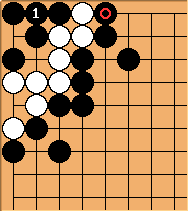 For White to win the ko, he must make two moves at and . 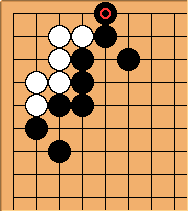 For Black to win the ko, he must make two moves at and connect at . Bill proposed that Black can hane with and start a ko with . 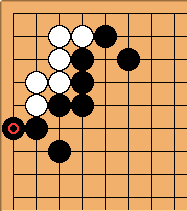 This is a two stage ko for Black, and White has a ko-threat at a. In most cases, this method is slightly better than the previous method. 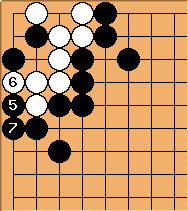 When Black wins the two kos, Black connects at to finish White off. When neither side has a ko threat, this is best. 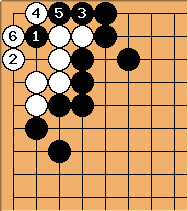 Note that both players threaten to make a ko. This is like a ten thousand year ko, either player can convert to a proper seki. The descent at does not affect the status of the group, which means that White is unconditionally alive. Defence against Black's attacks are identical to those listed in L+2 group.